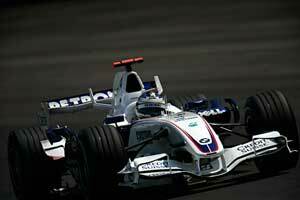 The BMW Sauber team was established at the end of 2005 when the BMW company acquired the Sauber team. The new operation entered F1 in 2006 with chassis built at Sauber's headquarters in Hinwil, Switzerland, and engines built at BMW Motorsport in Munich. The new team was run by BMW Motorsport boss Dr Mario Theissen. The BMW story, however, dates back to May 1922 when two Munich-based aero engine companies: Bayerische Flugzeugwerke AG and Rapp Motoren Werke were merged to form Bayerische Motoren Werke AG. Six years later the company acquired the Dixi Werke car factory in Eisenach and began to build Austin Sevens under license to the British firm. By 1934 BMW had begun to build its own cars but it was not until the late 1930s with the arrival of the BMW 328 that the firm established its sporting reputation. The 328 put the company on the map with good performances at Le Mans in 1939 and victory in the 1940 Mille Miglia. It was the start of a long history in touring cars and sportscars with numerous successes. BMW Specials continued to appear in races until F2 was canceled at the start of 1955. The new Formula 2 in 1956 was dominated by Coventry Climax engines while BMW's management was rather staid and steered clear of motor racing, despite the best efforts of Alex Von Falkenhausen. In the late 1950s, however, a new management came to power and sporting programs expanded with BMW beginning a remarkable series of victory in touring car racing. When the new 1600cc F2 regulations arrived in 1967 BMW produced an engine with an unusual four-valve Apfelbeck head in a Lola 100 chassis for drivers Jo Siffert and Hubert Hahne. The latter finished fourth in the Eifelrennen that year but success was rather limited and most of 1968 was spent developing a new car in association with Lola. The Lola-BMW 102s were driven once again by Siffert and Hahne and both led the team's debut race at Hockenheim. A few days later Siffert finished fourth at Albi. Hahne also drove a 102 at the German GP. The team started off slowly but aerodynamic development work, which increased dramatically as second and later a third shift were added at the windtunnel at Hinwil, and the car became quicker and quicker. Villeneuve was dropped and Kubica promoted and his arrival provided a breath of fresh air and awake-up call for Heidfeld. The team is growing fast and in hoping for better performances in 2007.